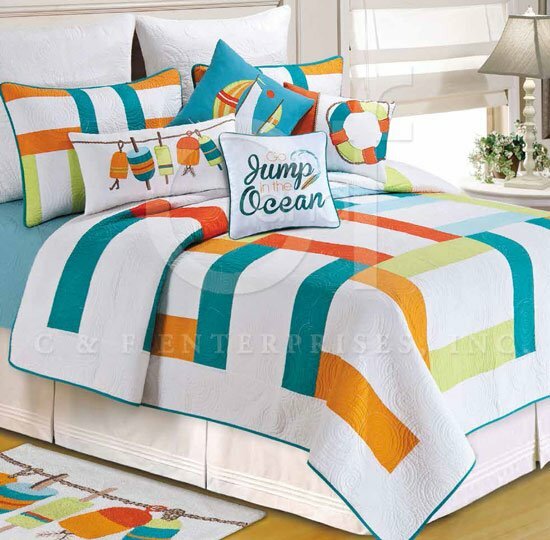 Zuma Quilt bedding by C & F Enterprises | PC Fallon Co.
Zuma Bay Twin Quilt has blocks of bright tropical colors on a white background. Turquoise binding trim at edges. Cotton Filled, Prewashed, Luxury Oversized. 66" x 86". We offer the complete ensemble in the Zuma Bay pattern by C & F.
Zuma Bay Full Queen Quilt has blocks of bright tropical colors on a white background. Turquoise binding trim at edges. Cotton Filled, Prewashed, Luxury Oversized. 90" x 90". Fits full and queen size mattresses. We offer the complete ensemble in the Zuma Bay pattern by C & F.
Zuma Bay Standard Sham has blocks of bright tropical colors on a white background. Turquoise binding trim at edges. 20" x 26". We offer the complete ensemble in the Zuma Bay pattern by C & F.
Zuma Bay Life Preserver Embroidered Pillow has a turquoise, green, and orange life preserver appliqued on a white soft canvas pillow with embroidered details accented by an orange band at one end and rope trim. 14" x 18". We offer the complete ensemble in the Zuma Bay pattern by C & F.
Zuma Bay Sailboats Embroidered Pillow has two boats with colorful sails appiqued on a turquoise background. 18" x 18". We offer the complete ensemble in the Zuma Bay pattern by C & F.